MYNDR is a smartphone application initiated by Aaron Boxer of MYNDR, Inc. Mr. Boxer partnered with the Aging Research Group at Olin College starting in the Spring of 2012 to test and further develop the application. The goals of MYNDR are to reduce the stress of caregivers of people with dementia as well as to help to keep those dementia patients independent for longer. PocketBrain is a smartphone application that grew out of the redesign of MYNDR. The Aging Research Group took the structure of the original MYNDR but replaced the content with information based on numerous user visits and design articles. PocketBrain uses the latest design practices and studies to build an educational application for older adults with little technology experience. This smartphone app is designed to be simple and intuitive, and to help the user to keep track of appointments, to-do lists, and miscellaneous information. A non-trivial portion of people who use oxygen also use walkers. However, when an oxygen bottle is placed in a walker basket, a number of problems ensue. The basket is filled, leaving no room for other objects to be carried. An even more significant problem is the decrease in stability due to the bottle – the walker is much more likely to tip over if even slightly lifted because of the concentrated weight high in the front. We are developing a method for carrying both traditional oxygen cylinders as well as the newer and more common Helio systems. We have come across a surprising number of interesting design constraints while working on this project. First, the users still need visibility in the area of the front wheels so that they do not run into or trip over things. 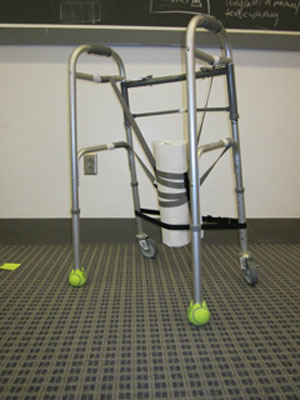 The walker cannot veer toward one side or the other as a result of our solution because the person using it is often frail or has trouble balancing. 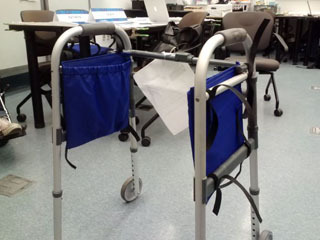 If possible, the walker should be collapsible with the carrier still attached for easy storage in a car or closet. Finally, if possible, the user should be able to adjust the oxygen flow while standing upright using the walker for support. One senior citizen from our community suffers from post polio syndrome as well as age related difficulties. Because of this, she has a walker with special arm attachments for more support and a tray on the walker to carry things around her house. The tray is slightly inclined and not very deep, so items often slide off during transit. 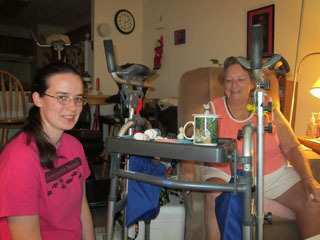 She then has to kick the items to her chair or wait until someone visits and can pick them up for her. We have designed special bags that attach on the inside of her walker to carry objects that would normally slide off, such as mail or bottles of seltzer. We also determined a solution for carrying both mugs and Solo cups and provided her with slosh-protectors to prevent spillage in transit. Challenge presented "Searchterm to find the solution"
Making buttoning buttons easier "Button Hook"
Hands-free way to hold up a book for reading "Book Holder", "Book Stand", "Bed and Chair Book Holder"
Making opening jars easier "Jar Opener"
Preventing sloshing while carrying liquids "Silicone Mug Cover"